Heat oven to 350°F. Spray bottom of 13x9-inch pan with cooking spray. In medium bowl, stir together softened butter and egg. Stir in cookie mix until soft dough forms. Press mixture in bottom of pan, using floured fingers. Bake 19 to 21 minutes or until golden brown. Cool 30 minutes. In medium microwavable bowl, microwave chocolate chips on High 1 to 2 minutes, stirring every 30 seconds, until melted. Stir in frosting. Spread evenly over bars. Cool completely, about 30 minutes. For bars, cut into 7 rows by 5 rows. 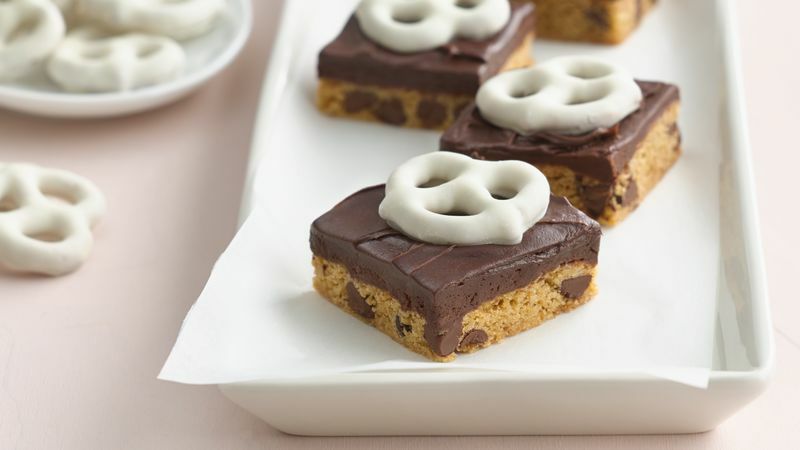 Top each bar with a yogurt pretzel. If you like, skip the cooking spray, and instead line the pan with foil for quick cleanup and easy bar removal.